Spectacular new 4K restoration reissued in the UK, 27 February. Newly restored in 4K by The Film Foundation and BFI National Archive in association with STUDIOCANAL, The Tales of Hoffmann returns to cinemas on 27 February, opening at BFI Southbank and selected sites nationwide. Rendering Jacques Offenbach's fantastical opera in vivid Technicolor, The Tales of Hoffmann represents the culmination of Powell and Pressburger's experimentation with the outer boundaries of an art form. Told through sequences which combine dance, opera and film, The Tales of Hoffmann continues an aesthetic adventure that began three years previously with the release of The Red Shoes. Moira Shearer features prominently once again, playing various roles in this story of a Romantic poet's fraught quests for love and lust - and the depths of man's folly in pursuit of both. The prologue to the tales takes place in the theatre of Nürnberg, where German Romanticist E.T.A. Hoffmann and his rival Councillor Lindorf both hope to meet Stella, the prima ballerina performing The Enchanted Butterfly. When Lindorf intercepts a token from Stella intended for Hoffmann, the poet retires to a nearby tavern, orders a drink and recounts three stories of romantic misadventure to the rowdy student clientele. Moving from the fashionable boutiques of Paris to bacchanalian orgies in a nightmarish Venice, and from the naiveté of youth to the weight of experience, Hoffmann's stories combine to form three facets of their narrator's evolving struggle with true love. 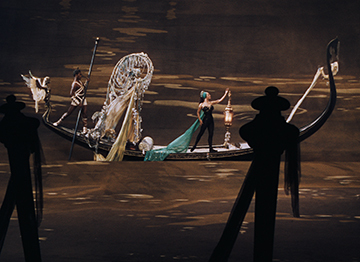 The Tales of Hoffmann returns to cinemas on 27 February, opening at BFI Southbank and selected sites nationwide. The Tales of Hoffmann has been restored by The Film Foundation and the BFI National Archive in association with STUDIOCANAL. Restoration funding was provided by the Hollywood Foreign Press Association, the Franco-American Cultural Fund, The Film Foundation, and the Louis B. Mayer Foundation.